If you’re thinking about getting a DSLR camera but want to remain value conscious, you should consider the Nikon D3200. It’s true this camera can help you capture precious moments in your life through snapshot, but this model can do so much more. Below, we take a look at 4 things that you might not have known your Nikon D3200 DSLR could do. With your Nikon D3200 DSLR, you won’t have to transfer your snapshots to a computer to spruce them up. In editing mode, you can crop your photo, remove red eye, and adjust lighting and color. You can also rotate crooked photos to straighten them out and adjust perspective, so those pictures of buildings you took won’t look like they were about to fall on you. The edit mode also gives you the ability to give your photos an Instagram effect — you can transform your color photos into black and whites, or create sepia and cyanotype images by selecting the monochrome picture control feature. The best part of the Nikon D3200’s editing tools is that no matter what changes you make to your photo, the Nikon D3200 DSLR saves a copy of your original photo so if you don’t like the changes you made, you can always start over. If you are one that loves snapping a photo of your adventures and uploading them immediately to the web, you will be pleased to know that the Nikon D3200 DSLR gives you that ability. The Nikon D3200 DSLR comes equipped with a WU-1a Wi-Fi adaptor so you can quickly transfer your high-quality and edited snapshots to not just the web to share on social media or to a photo-printing site, but also to your mobile phone, tablet and computer. You can even use your android or iOS device as a remote for your Nikon D3200 DSLR so you can jump into a photo with your friends or take a selfie. The Nikon D3200 DSLR isn’t just about taking snapshots, it is also able to shoot full HD video with sound that is record through an internal microphone or a microphone attachment. With the Nikon D3200 DSLR, you can shoot up to 20 minutes of move-like video by selecting a frame rate of 24 frames per second; capture still images in your film; and also trim you movies and save clips as separate files. 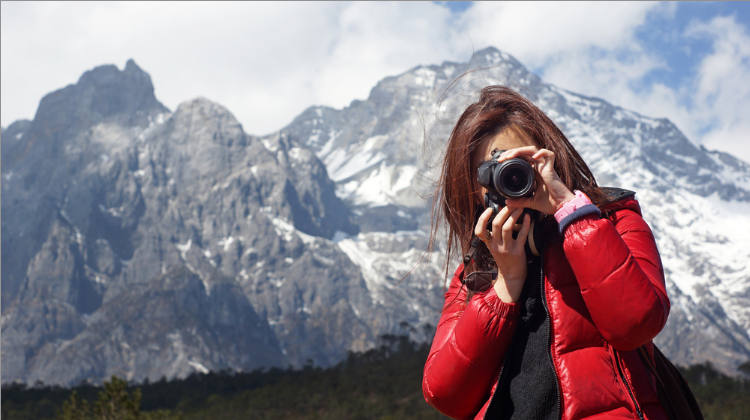 The Nikon D3200 DSLR, which has been named an entry-level DSLR, which is perfect for travelers according to CNN Travel, can be also upgraded when you are ready to take the next step. The camera, unless you purchased a bundle pack, only comes equipped with an 18-55 mm lens, but a 55-200mm lens attachment will allow you to zoom in and take a photo from a further distance and can be bought separately. The upgraded lens will cost you about $250 or you can buy a refurbished lens for about $150. Woman with camera image courtesy of Shutterstock.